HOW NETFLIX EARNS? REVENUE MODEL. Netflix Inc was incorporated in Aug, 1997 and its operations began in April, 1998. Today, it is the leading television network of the world with more than 139 million subscribers globally. Everyday members from more than 190 countries enjoy around 140 million hours of streaming content on Netflix. The streaming service allows its users/members to watch a large variety of content including movies, documentaries, Netflix originals as well as other form of content which is accessible on nearly all internet devices. There are no limits and paid members can enjoy unlimited content. However, subscription plans differ and some limits related to number of screens and quality of content may apply. Netflix has seen its popularity and customer base grow very fast. The popularity of internet-based streaming services has grown a lot in the recent years. There is also a lot of competition from the likes of Amazon Prime, YouTube, Hulu and others. Netflix has focused on content quality, marketing as well as growth of its subscriber base for profitability. Its business model has some distinct features that are the main reason behind its popularity and leading position. The corporate headquarters of Netflix are located in Los Gatos, California. In 2018, Netflix added around 28 million net new subscribers. While the success of Netflix can partially be attributed to the growth of internet and internet-based services, there are other sources of competitive advantage too that have helped it achieve a leading position in the streaming segment. Several things have changed over the last decade from the way people accessed information and entertainment as well as technology and people’s tastes. People have moved on from the linear TV experience to the streaming video content. The linear TV experience does not offer the same flexibility as the streaming video channels. The flexibility that internet offers has continued to grow the popularity of streaming services. The way internet has grown ubiquitous, one can expect Netflix to continue to remain in lead for a longer time. While internet is now more reliable and faster, the growth in use of smart devices including smart TVs and smart phones as well as tablets also has driven the growth of internet entertainment. Moreover, the freedom and flexibility that internet entertainment offers as well as the rapid pace of innovation are also aiding the growth of entertainment platforms like Netflix. US is both the largest and the most deeply penetrated market for Netflix where it aims to increase its membership ultimately to between 60 and 90 millions. One key strength of Netflix is its differentiated business model. It is not a generic video company but a TV and movie series network. Overtime, Netflix is trying to differentiate its serice even further from its closest competitors. Netflix is successful today, but it has not been an easy journey but instead the company has been through its fair share of troubles before reaching this point. It had not started as the Netflix it is today but as a DVD by mail company in 1997. For the first five years, Netflix had to struggle to achieve a sustainable business model that was cashflow positive. During the next five years, Netflix was fighting against Blockbuster in the United States. It started streaming in US in the year 2007 and internationally in 2010. The Qwikster DVD fiasco took place in the year 2011 and then the first original series came in 2013. Around twenty years after its beginning, the company went global in 2016. In that year, it launched its services across more than 130 countries. So, over its lifetime, Netflix has seen quite a bit of struggle and continued to improve and strengthen its business model. Today, it is a global company offering its services in nearly every corner of the world except China. The business of Netflix is divided into three major reportable segments that are Domestic streaming, International streaming and Domestic DVD. In the domestic streaming segment, the number of paid memberships at the end of 2018 was approximately 58.5 million and the company added around 5.7 million net new paid memberships in the year. The nuber of free trial memberships at the end of the fiscal year 2018 was around 2.1 million. The number of paid memberships in the international streaming segment at the end of the year 2018 was around 80.8 million. The company added approximately 22.94 million new members in the international segment. The number of free trials in the international segment was around 7.1 millions. In this way, the total number of paid memberships at the end of 2018 was 139.3 million. The company added more than 28 million new paid members to its subscriber base in the streaming services including international and domestic in 2018. In the year 2017, the number of total paid subscribers for streaming services was above 110 million. Total number of free trials (domestic and international streaming) at the end of 2018 was above 9 million. In the domestic DVD segment, the total number of paid subscribers was around 2.7 million and the number of free trials was around 25 thousands. The target consumer of Netflix is the millenial user from the affluent segment. Lifestyles of consumers have changed a lot in the recent years. More and more users are flocking to online channels to satisfy their need for entertainment and utilizing several channels apart from social media and online screaming to access content. Netflix mainly targets the affluent young users with an international credit card. The millenial user whether a college goer or an employed professional is unable to utilize traditional channels of entertainment for several reasons. While online channels fit better in his lifestyle, the level of accessibility and flexibility any specific channels offers is also a major determinant of which one the user prefers. Monthly membership fees across all the three business segments are the major source of revenue for Netflix. In the domestic streaming segment, it derives its revenues mainly from the monthly membership fees for streaming online content to members/users in United States. In the international streaming segment, the company derives its revenue from the monthly membership fees from streaming online content to the international subscribers. In the domestic DVD segment too, it derives its revenues from monthly subscription fees for DVD by mail. The focus of Netflix is both membership and revenue growth. A larger customer base means higher scale as well as higher reach and more word of mouth. Its focus is also on revenue growth since that allows it to improve content and service quality as well as maximize shareholder returns. The company offers several tiers of pricing so the people can buy one that suits their needs and circumstances. In the streaming segment, the company offers three main plans starting from Basic. The basic plan is a one screen standard definition plan and the user can watch on a one screen at a time. However, he still has unlimited access to ad free content. He can watch anytime from anywhere on one screen. The next plan which is also the most popular plan is Standard plan. In this plan users get to watch content in High Definition wherever applicable and can use two screens to access Netflix content. Netflix also offers 1month free trials. The company also keeps testing new pricing approaches including various tiers and pricing points for the sake of understanding customer demand. However, despite testing new approaches the company did not have to lower its prices in new markets for growing its membership base. Instead of lowering prices, the company has focused on improving the quality of content across all the dimensions including content, streaming delivery, payment methods, user interface, etc. The growth that Netflix has achieved in Latin America is an example of this approach. Netflix total revenues from domestic streaming by the end of the year 2018 was 7.65 billion Dollar. The total number of paid members at the same period was 58.5 million. Its total revenue from international streaming segment at the end of the fiscal year 2018 was 7.8 Billion dollars. Total revenue from streaming in 2018 was 15.4 Billion USD rising form 11.2 Billion USD in 2017. The total revenue of Netflix from the domestic streaming in 2017 was 6.15 Billion and that from the international segment was 5.1 Billion dollars. Average global monthly revenue per paid membership during 2017 was 9.43 dollars. Revenue from the domestic DVD segment was 365.6 million compared to 450.5 millions in 2017. Memberships increased in the streaming segment globally leading to a rise in revenue whereas the number of member ships in the domestic DVD segment fell leading to a decline in revenue. Netflix is focusing on growing both its subscriber-base and revenue. With growth in the number of memberships comes revenue growth as well as higher scale. Net income of the company jumped from approximately 559 millions in 2017 to 1.2 Billion USD in 2018. 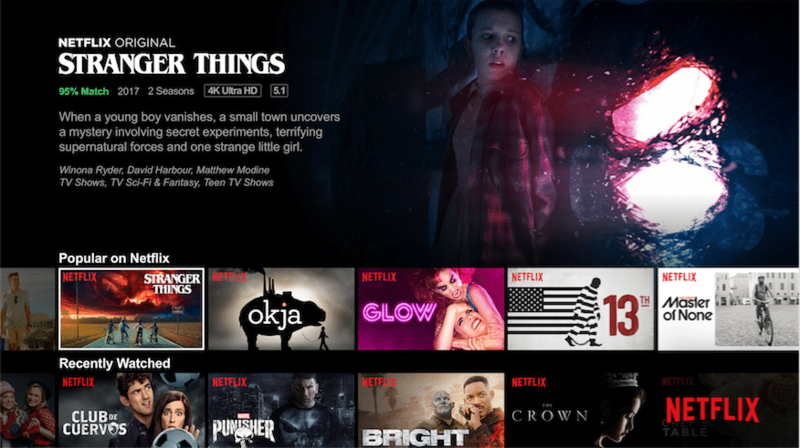 Content offered by Netflix varies by region and includes a large variety of content including documentaries, ward winning shows, Netflix originals and more content. The focus of Netflix with regards to content is to understand people’s tastes and accordingly bring them a large range to choose from. Even in a single market, people’s tastes may vary broadly. A simple and fast learning user interface allows Netflix to offer suggestions based upon the user’s choices. Froom action blockbusters to Korean soaps, anime, sci-fi, Sundance films, zombie shows, or kids cartoons, Netflix offers a wide variety of suggestions for the user on his homepage. Netflix acquires, licenses and produces content including its own original programs so as to offer its members unlimited viewing of TV shows and movies. In the recent years, Netflix has grown its range of original programs, many of which are Emmy, Golden Globe and Academy award winning documentaries and original series. This is also an important point of differentiation which has been able to differentiate its services a lot from its competitors. The company is at scale since 2013 which allows the company to create more original content economically. With growing scale, its range of original content has also grown. As it has continued to produce more originals, that has helped Netflix acquire more experience, understand people’s tastes better and how each original affects its brand overall. Licensing of content is generally time based where Netflix pays for a multiyear exclusive subscription Video on Demand (SVOD) for any given title. The content industry is highly fragmented and in each market Netflix can license content from multiple suppliers. Netflix has not used a pay per view or ad supported content. Instead it has used a flat fee unlimited watching business model. Another major differentiator of Netflix services is the level of content personalization. Netflix serves highly personalized content to its subscribers. The focus is to serve the right content to the right person. Achieving higher level of personalization has also helped it achieve high level global popularity and stronger word of mouth. Original series is a rapidly growing proportion of its content and it has helped the company make greater headway into the right direction. The large range of original content also gives the brand some strong competitive advantage as compared to its competitors. Now, the company is also making original programming in non English languages. Apart from US, the company also has a large subscriber base in non-English countries like India and Japan. Such emerging markets have great potential and offer a substantially large customer base. Another major advantage that a Netflix subscription offers is that you can download content to your iOS, smartphone or windows device and watch it later even without an internet connection. So, apart from interesting and engaging content suited to various categories of viewers, the brand offers excellent level of personalization, service quality and customer convenience. The company uses marketing for promotion of its content and to drive viewership. It utilizes a large variety of channels for promoting its content and brand. The company has been able to grow its subscriber base quite fast using a large variety of promotional channels. Apart from digital advertising and social media, the company also utilizes a broader array of marketing channels and public relations programs that help it drive viewership and grow user base. Word of mouth has also helped it grow its popularity and subscriptions worldwide. The brand has increased its spending on paid marketing which showed in its marketing expenses for 2017 and 2018. Marketing costs grew from 1.4 Billion dollars to 2.37 Billion dollars. The company has also used several kinds of partnerships for promotions and to make Netflix content more accessible to viewers. These companies have made it easier for users to discover, sign up, use and pay for the services of Netflix. Major partners of Netflix in this regard include consumer electronics device companies, game console manufacturers, pay TV and mobile operators, Internet service providers, mobile device and set top box manufacturers, and the physical retailers. The company also makes marketing arrangements with companies for the promotion of Netflix, increase general awareness regarding the brand and to attract new members. These partnerships do not just help Netflix but benefit the partners as well. These companies also benefit in the form of customer acquisition, the opportunity to upsell higher value packages of speed/data/content, lower churn rate and higher brand affinity. The payments that Netflix makes to such partners are recognized as marketing expenses. The company clearly had a strong branding strategy with central focus on customer convenience. Apart from selling affordable packages and making its content highly accessible, it also focused on people’s taste and creating great quality original content as well as providing a highly personalized experience to its users. Word of mouth has also played an important role in the marketing of Netflix. It became one of the most talked of online entertainment brands. The difference clearly was in the type of user experience and the level of convenience the brand offered. It worked to know people’s taste and after that it focused on engaging and original content. Then it differentiated its services to a level that made it an easily recognizable and outstanding brand. Instead of using aggressive growth techniques and trying to push viewers, it employed a balanced strategy aimed at pulling audiences in larger numbers from around the world. Several times people have raised a question regarding its expenditure on original content and why it is spending so much if not just for the sake of differentiation. While competition is a major challenge, product quality and user experience are of paramount importance for Netflix. It is investing in what it considers suits the taste of its audience from various parts of the globe. This has helped it attract and retain customers. In this way, the brand was also able to build a strong reputation whose benefits are growing more and more obvious. With increased scale, the brand is more confident about producing its own original content economically. Moreover, it expects to attract and retain new viewers in larger numbers just by focusing on exclusive content. This is an art that Netflix has mastered through experience. Customer experience is now the most important part of marketing and apart from user convenience Netflix has continuously improved service quality in all its dimensions including content quality, user interface, downloads, streaming etc. The more engaging the user experience, the higher is the popularity level and the lower the churn rate. You cannot avoid social media when you are taking a generation of customers that spends a very large part of its time on Facebook, YouTube and Instagram. Social media is also a major part of the promotional mix of Netflix. The company uses these channels for promoting its products and user engagement. Apart from promotional posts and videos, it also uploads the best scenes from specific programs to engage users. On top of all, it has got a nice large user base of around 55 million on Facebook. In 2017, its total base of paid subscribers was only 110 millions. So, you can imagine the kind of reach Facebook helps it achieve. The largest social media channel of more than 2 billion users helps reach customers in households around the world. By using Facebook to highlight the best content, Netflix also sues it to increase use among existing users as well as attract new ones. On YouTube it has around 7.5 million followers and on Instagram around 12.9 million followers. It has uploaded more than 2600 videos including promotional videos like trailers and scenes as well as behind the scene and interview videos. YouTube offers access to a large pool of customers and can be great for attracting new customers. Every brand with a video marketing strategy and especially the entertainment brands use YouTube for promotions. The company employed around 5,500 employees as of 2017. Unlike the other unique things about Netflix it has also established a unique company culture. Organizational culture has grown very important in the 21st century. Apart from other things, it influences employee motivation, productivity and the level of collaboration inside an organization. Netflix values integrity, excellence, respect, inclusivity, and collaboration. It has established a fun, stimulating and creative culture whose focus is he free flow of ideas, innovation, independent decision making, passion and integrity. Netflix strives to hire and retain only the best. However, its culture encourages open exchange of ideas and breaking rules. Netflix is facing heavy competition from several sources. Apart from the direct competitors in the streaming video section, there are many more competitors in the entertainment, social media and gaming segment. Currently, Netflix is trying to further differentiate its services from its competitors to retain its competitive edge. It is not just the streaming video providers like Hulu, HBO or Prime but other social media sites like Facebook, twitter and YouTube as well as TV, DVD, DVOD and video games are also important competitors of Netflix. The entertainment industry is quite broad and there are several companies competing directly or indirectly with Netflix to win the customers’ precious time. Video piracy is also a threat. Netflix has focused on strengthening its edge by investing in original content and superior customer experience. Netflix has been able to achieve success after having struggled for several years. However, despite this growth, there are challenges in its way. The company faces strong competition globally from several sources. There are other forms of risks too and challenges in the way of fast and profitable growth. While competitive pressures are a major challenge in the way of Netflix, there are other risks involved in its business too. The company is also facing regulatory pressure as well as other threats from several more resources. The company relies upon a number of partners to make its content available to its subscribers from all around the world. Privacy concerns have also increased the level of risk involved in the business model of Netflix. Apart from it, technological advancements are happening at a fast pace which can cause competitive threat to grow larger. Apart from marketing and costs related to content production, there are other major costs too involved in the production of original content, its marketing, personnel expenses as well as research and development. Technology and development expenses of the brand increased from 953 millions in 2017 to 1.2 Billion dollars in 2018. Marketing costs of the brand rose from 1.44 Billions in 2017 to 2.47 Billions in 2018. General and administrative expenses increased from 431 million to 630 million in the same period. The cost of revenues rose from 8 Billion dollars to 9.96 Billion dollars during the same period. Net income was 1.2 Billion in 2018 against 558 million in the previous year. Netflix has seen a lot of growth since it entered the international markets in 2016. Within these three years, its subscriber base has grown a lot. The number of paid memberships in the streaming video segment including domestic and international has grown to 139 million in 2018 from 89 million in 2016. This is a sharp jump. However, while growth has brought more confidence and the brand is trying to strengthen its edge through differentiation, there re challenges ahead. The company is spending a lot on producing original content. There are other expenses too which are affecting net income. However, it is a heavily competitive market and apart from HBO or Prime or Hulu, Facebook and YouTube are also important competitors. Differentiation and user experience have helped Netflix retain its popularity. Netflix is not planning to increase prices fearing that it can lead to erosion of customer base and market share. These things apart from privacy concerns and higher government regulation are making the situation challenging. Most people anticipate that viewership in US has reached a point of saturation but the company is bullish about growth expecting its userbase in United States to rise to between 60 and 90 millions. Apart from accessibility and superior user experience, original content is also a major strength in this business model. Differentiation is clearly going to benefit the brand but maximizing shareholder returns can be a challenge for it since a lot is going into producing original content. Netflix Q4 2018 Financial Statements.